IN WINTER WEATHER, we suggest you use the Lavina Street entrance which is the first street to the south of our building next to the Spay-Neuter Clinic. It's a wider street and more accessible. Please park against the yellow parking bumpers in the lot behind our building, and enter in the door flanked by our concrete sheep (not shown on the photo). 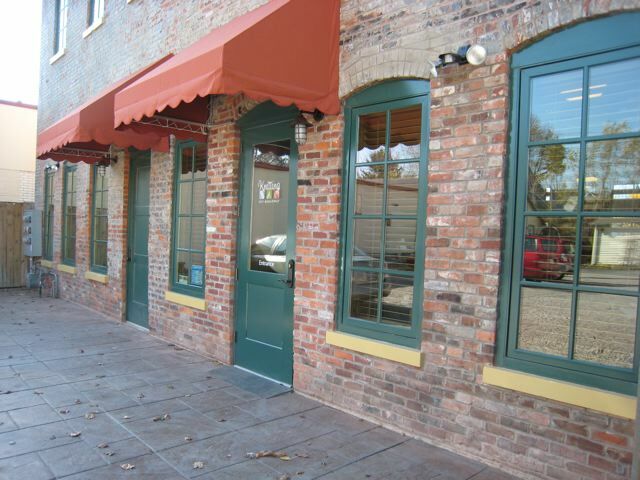 We are located on Broadway in the 2-story brick building that just opened after months of extensive renovation. To reach us from the north, we are exactly two blocks south of the Broadway/Jefferson intersection. Aaron's Oriental Rugs is on the northeast corner (your left) where you turn. To reach us from the south, after you've passed the GE buildings and passed under the elevation, you'll be turning right just past the restored firehouse onto Lavina Street; or one block further north past the spay-neuter clinic and in front of Aaron's Oriental Rugs onto Brackenridge Street. Parking is one-half block "off Broadway" located between Lavina and Brackenridge streets. Our parking lot is behind our building at 1309 Broadway, and across from our former location in the yellow, 2-story stand-alone building with a courtyard and a 3-car garage, facing the alley the entire width of the block.